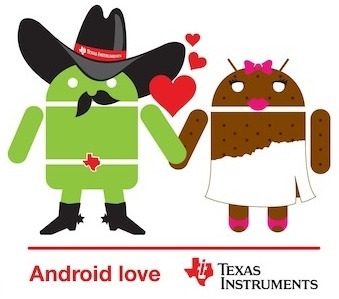 Google Chooses TI’s New OMAP to Lead the Ice Cream Sandwich Charge? The image above has been sent out to a number of sites this week as a potential promotional tool for TI to use in the fall, which has led many of us to believe that Google has chosen their OMAP4 processors to further develop Ice Cream Sandwich and possibly even the next Nexus device. We likely won’t know for sure until we get closer to that Q4 release time frame that Andy Rubin told us about back at I/O, but this would be a pretty good sign as to what we can expect. Speculation as to which TI processor will make the cut has essentially been narrowed down to the 4460 and 4470. We have seen the 4430 in devices like the DROID3 and soon to be released DROID Bionic, but are thinking Google will want to step it up a notch with this next Nexus device. The 4460 can be clocked up to 1.5GHz, pump out full 1080p 3D content and started sampling at the beginning of 2011 (seems like the clear choice). The 4470 on the other hand hasn’t even started sampling to our knowledge, but is supposed to bring significant graphics and memory improvements over the 4460, while also packing a 1.8GHz punch. It’s anyone’s guess as to which particular chipset, however, it’s looking like TI has been given the thumbs-up. You guys good with OMAP4? Or were you hoping for something out of the Qualcomm camp? Maybe even NVIDIA’s Kal-el?